All government services in Kenya are going digital. As we noted in an earlier article, it is now possible to perform land searches online. In addition, you can also query and pay land rent online right from the comfort of your home or office. In fact, you can even query and pay land rent using your mobile phone. This service is saving people lots of time. You no longer have to waste long hours in a queue to find out and pay your land rents. In fact, the Ministry of Lands is no longer accepting manual payments. Log into to eCitizen and sign up or sign in if you are already registered. Click on Ministry of Lands & Physical Planning and select Make Application. Next, enter your Title Number – e.g. NAIROBI/BLOCK123 and the parcel number – e.g. 321 which is found on the Certificate of Title. Fill in the online form and submit. Confirm all the details and proceed to pay using available payment options. Once payment has been confirmed, you have the option to print the results or simply leave the results in your eCitizen account. Begin by registering. Send the word ‘lands’ to the shortcode 21504. Once you get a confirmation, dial *512# to request amount due. 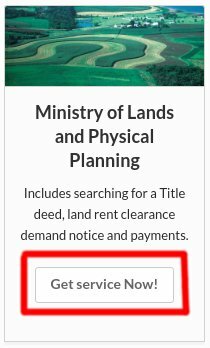 You can also perform a land search online, report missing land records and soon stamp duty will be payable online.